One of the most attractive things about the flowers is their beautiful reserve. 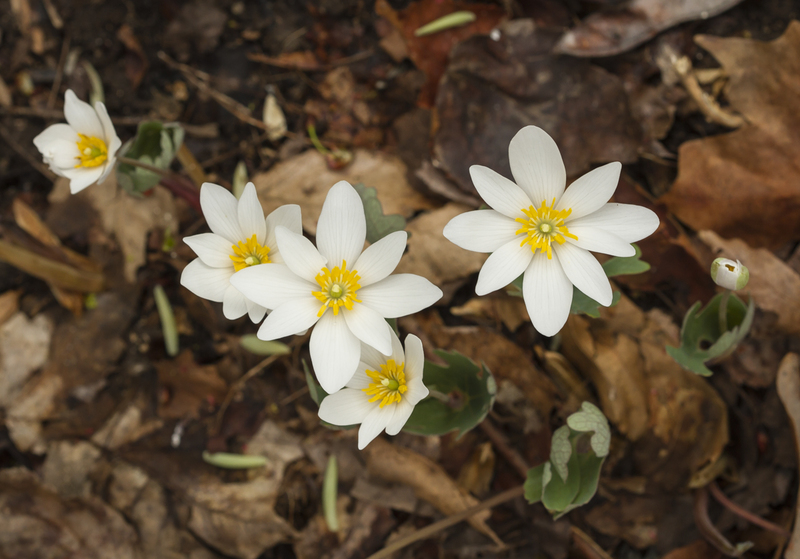 The beautiful, pure white petals of Bloodroot, Sanguinaria canadensis, are almost finished now. Their time is brief, only a few days for each flower. 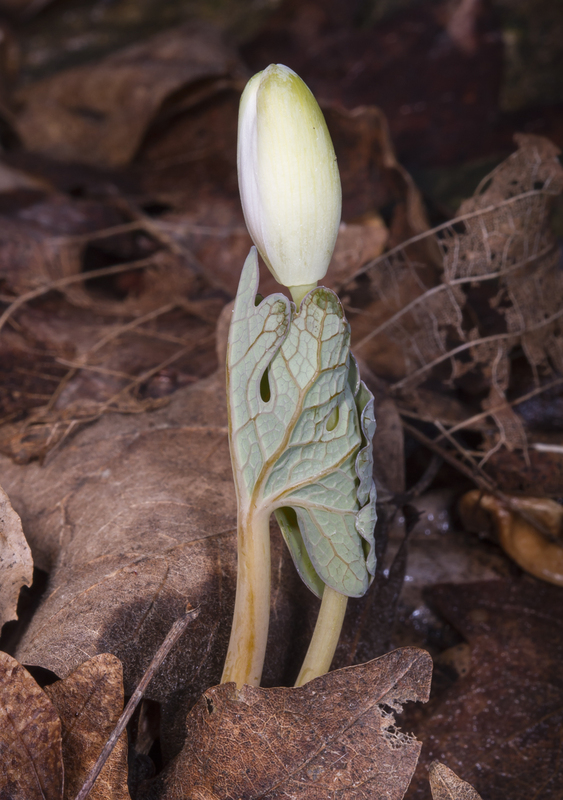 They emerge in early Spring, each flower bud wrapped in the protection of a single leaf. On a very cloudy or rainy day, or during a late cold snap like we had last week, the flowers remain closed. But let the sun shine and temperatures warm, and they open to reveal their intense white, complimented by the bright yellow of the stamens and pollen. The flowers produce no nectar, but are occasionally visited by pollen gathering bees, or by other insects fooled by the showy display in an otherwise often flower-poor landscape this time of year. If the flowers are not pollinated in a couple of days, the anthers bend towards the stigma, ensuring self pollination, probably a good hedge for a plant that blooms early in the year when insect pollinators may be hard to come by. Several stems may arise from a single rhizome, leading to small clumps of the brilliant white flowers. 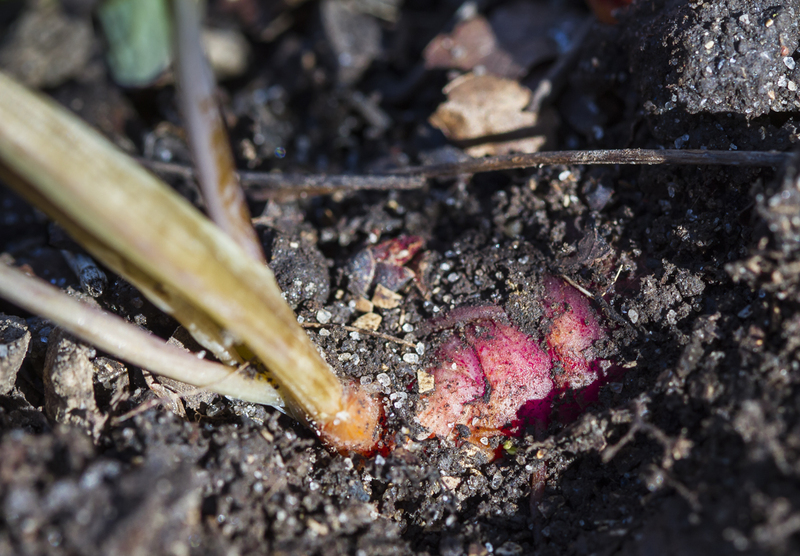 And it is the rhizome that gives this plant its unusual name, Bloodroot. 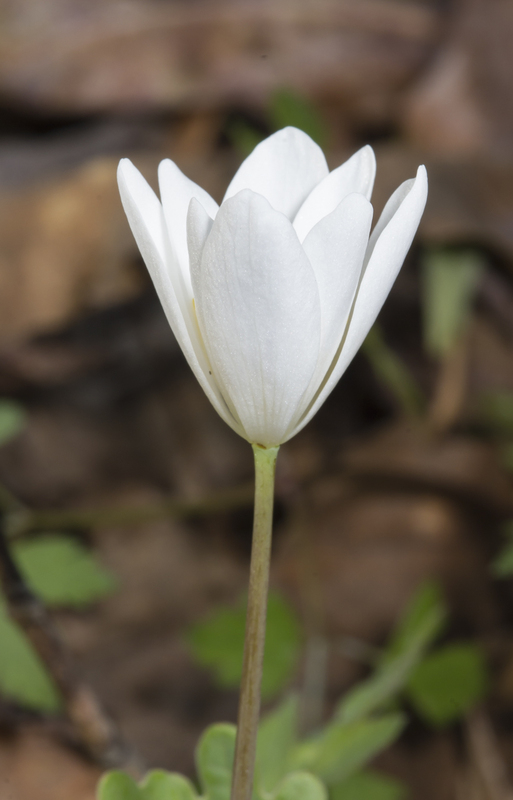 This is the only species in the genus, Sanguinaria, and it is a member of the poppy family of plants. The word originates form the Latin, sanguis, which means blood. 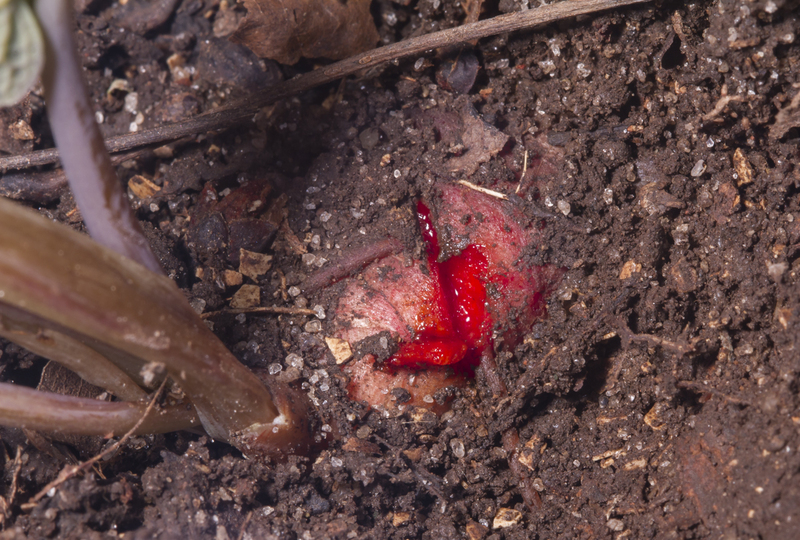 If you dig down to find one of the roots, you can see why the plant is so named, the roots are indeed a blood red in appearance. Cut into the root and it bleeds a red fluid. The red juice was used by many tribes of Native Americans as a red dye and body paint. It has also been used for various medicinal purposes from a cough suppressant to a treatment for skin ailments. 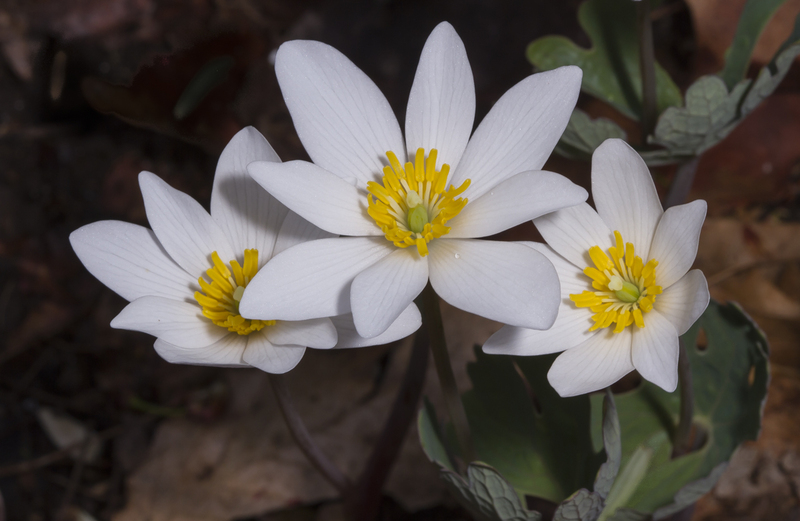 If I am not mistaken, I remember my grandmother used a poultice that contained Bloodroot, for a skin lesion on her leg. The active ingredient, sanguinarine, is a toxic alkaloid that can kill animal cells. It is being studied for potential cancer treatment, although it can also induce oral cancers if taken internally. Ironically, it is used commercially in low doses as a dental hygiene additive for fighting bacteria and plaque. 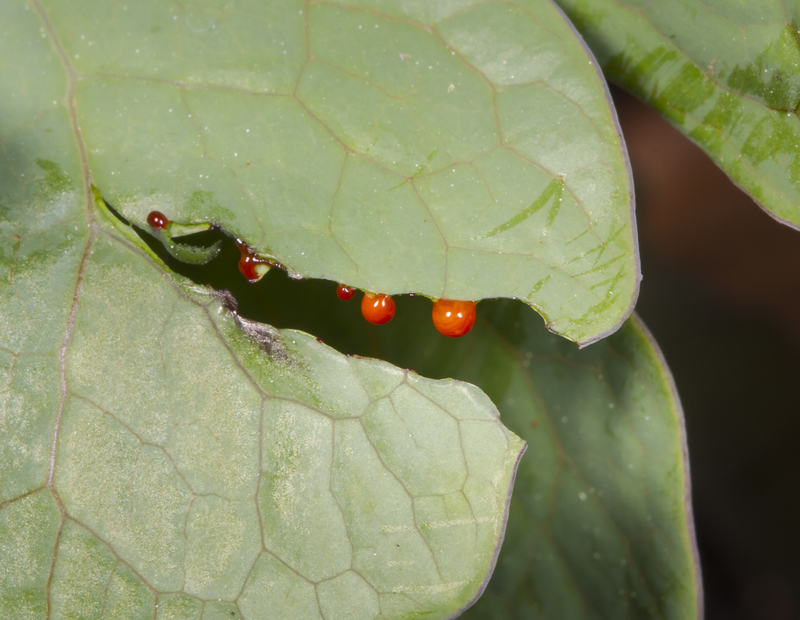 All parts of the plant contain these compounds and if you gently cut a leaf, it appears to bleed an orange-red blood form the severed veins. While it seems this might protect the plant from being eaten, I cannot find any of these beautiful flowers outside my deer fence. But here in the yard, there are several small clumps thriving, pushing up through the leaf litter, even when it is still too cold for most plants, sharing their dazzling petals, if only for a few days. Perhaps that is why the word sanguine means confidently optimistic and cheerful. More on the ecology of this wonderful wildflower tomorrow. 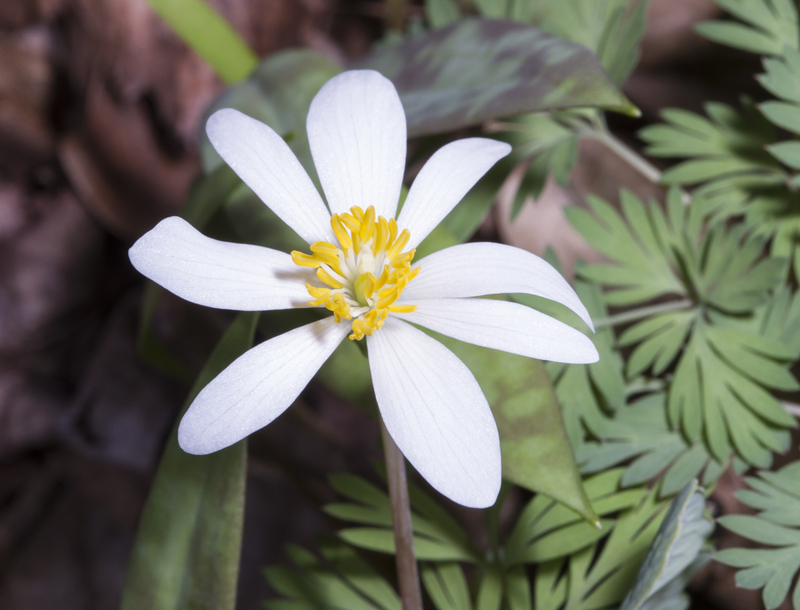 This entry was posted in Natural History and tagged bloodroot by roadsendnaturalist. Bookmark the permalink. So excited to see this. We were in VA mtns last week and saw several along the driveway. The Dutchmen’s breeches (?) were also in bloom. I have a few Dutchman’s Breeches as well, but they were planted here, not that common in these parts. Fascinating!!! Thank you so much for these most interesting and educational postings about the little things all around us that are really such big things! Thanks, Elise. Check back tomorrow for more on this amazing plant.